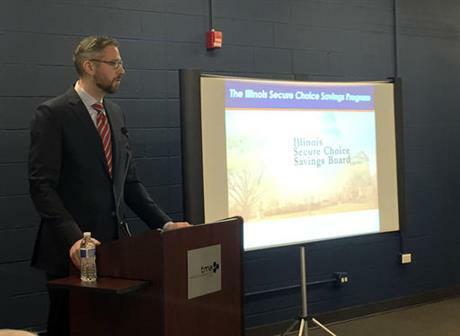 Dozens of small business owners recently gathered in Schaumburg, Illinois, to learn about the new state-sponsored retirement savings initiative, “Secure Choice IRA.” Officials said it could help about 1.2 million workers who don’t have access to an employer-sponsored retirement plan. California’s plan will automatically enroll about 6.8 million employees. Employees can opt out of the plan and employers are not required to match contributions. Payroll deductions are expected to start in 2018. The plans with automatic payroll deduction are IRAs and are tax-deductible, which means employees get a tax incentive because they don’t pay federal taxes on the money saved for retirement until they’re withdrawn. A spokesman for Labor Secretary-nominee Andrew Puzder said it would be “premature” for the fast-food executive to comment on this issue before being confirmed. That includes workers like, Otto Deurloo-Willard, 31, a store manager at the Cork & Bottle Shoppe, a liquor store in Oregon. He earns $12.50 an hour, slightly higher than Oregon’s minimum wage. He doesn’t have a retirement plan at work and said he didn’t think about saving until he got engaged. “I’m at a different point of my life. I’m getting married, and we are planning for a life together,” Deurloo-Willard said. “States win when more people are prepared for retirement and financially ready to be self-sufficient, which reduces the need for state spending on elder-support programs,” said Gerri Madrid-Davis, AARP Director of State Advocacy and Strategies. Democratic state Sen. Daniel Biss, who introduced Illinois’ program, has called it the “most efficient and least intrusive way” to help people save for retirement while putting little burden on the state’s employers. “If a business can afford to do this kind of thing, they would do it for their employees,” Grant said. Jennifer Piacenza, operations manager for Palatine Welding Company, said she’s excited about Secure Choice but worries that the 35 employees at her family business won’t take advantage of it.